We decided to visit this old station and to go there on the old paths in order to enjoy a walk in nature and peace. It is a route situated 5 Km from the station and if you enjoy hill walking it’s worthwhile. That station was opened in 1928, if I remember correctly. When you reach there you find a small passageway which leads you to this era, it’s like crossing a tunnel to the past. Its old roofs, its loose tiles and the grass which today grows in the tracks, transports us to those difficult times where people waited on the platforms to greet some relative or friend. The old trains were left to their fate and these days you can see the remains of what one day was full of people. 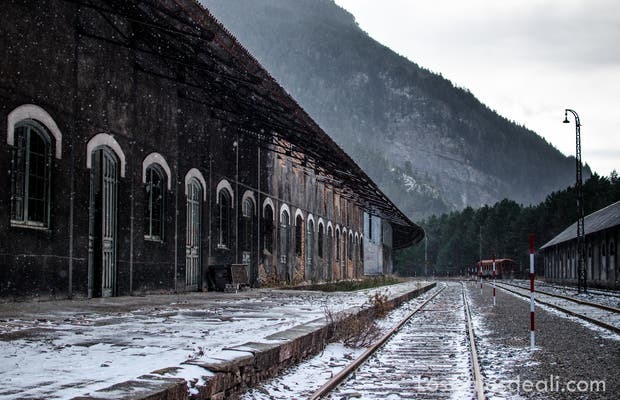 The Canfranc railway station always impresses: for its size, its history and for the personal stories which it guards, but in winter and snow much more impressive. The sensation is a mixture of admiration for what was and pity for the inability to return this place to the glory of its architecture, its size and its strategic geographic position.